Sometimes the feature attraction is not the star in the theater of travel experiences. In our recent visit to Big Bend National Park I’d have to say it was the entire cast of desert offerings that made the visit memorable. It started with our accommodations. 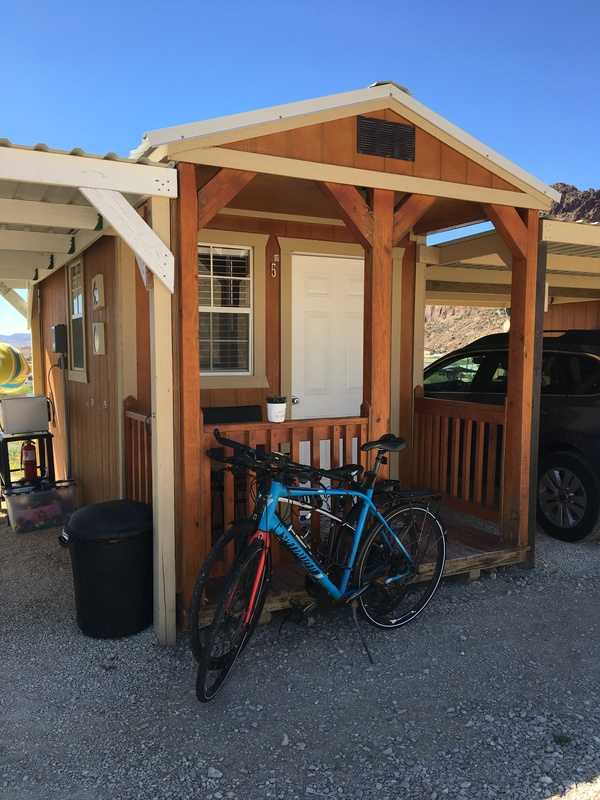 Choosing to stay just outside the park where there were more amenities, we had reservations in the Terlingua Nights Cabins. Situated in the desert dust, the little sleeping rooms were just that. We had electricity, a mini fridge and barely enough room to walk around the double bed in our pristine minimalist room. We shared the bathhouse and an outdoor living area with a fire pit with our cabin neighbors. It was 93 degrees when we arrived, with a brisk wind sweeping through the grounds. By evening, it was comfortable to sit out on our porch to read. It felt like the desert. 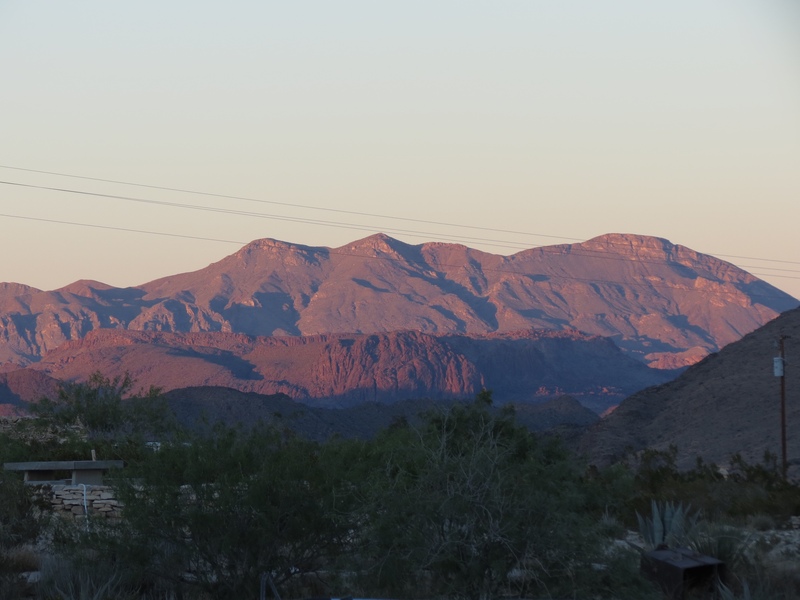 The revitalized ghost town of Terlingua lay a few miles down the road. 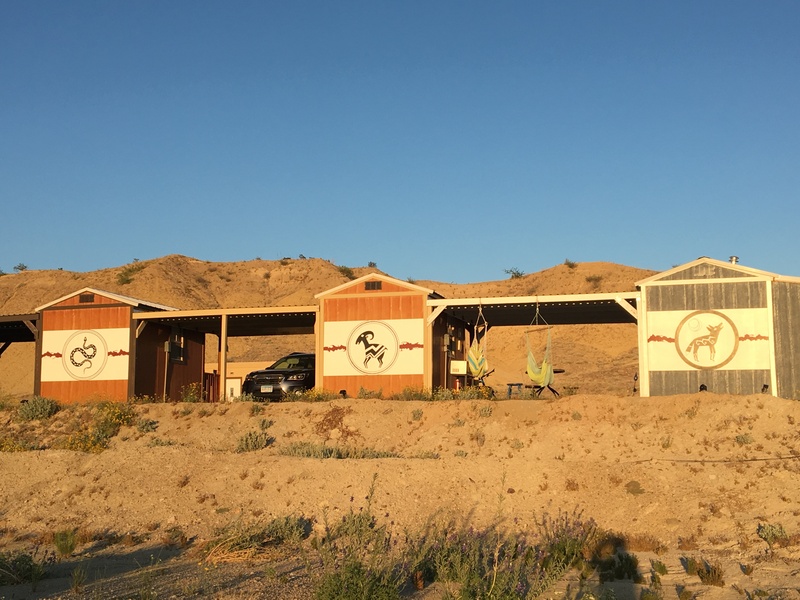 Driving over to search for dinner options, we surveyed some of the competing lodgings – tents, tepees, a pastel “Easter” motel and shacks dotted the dry countryside. Hardly your typical National Park tourist environs. We stumbled on a humble eating establishment and settled into the last two seats out on the shaded patio. The slow service suited the warm air and we lingered over our Tex-Mex meals while chatting with nearby diners. The long bench on the porch of the Trading Company was reputed to be the place to watch the sunset play out on the distant mountains. I insisted we do just that. We left our little cabin well before dawn in order to watch the sunrise in the park. We didn’t count on a rough dirt road to reach our chosen scenic location, and decided to detour on the paved but still-slow road. 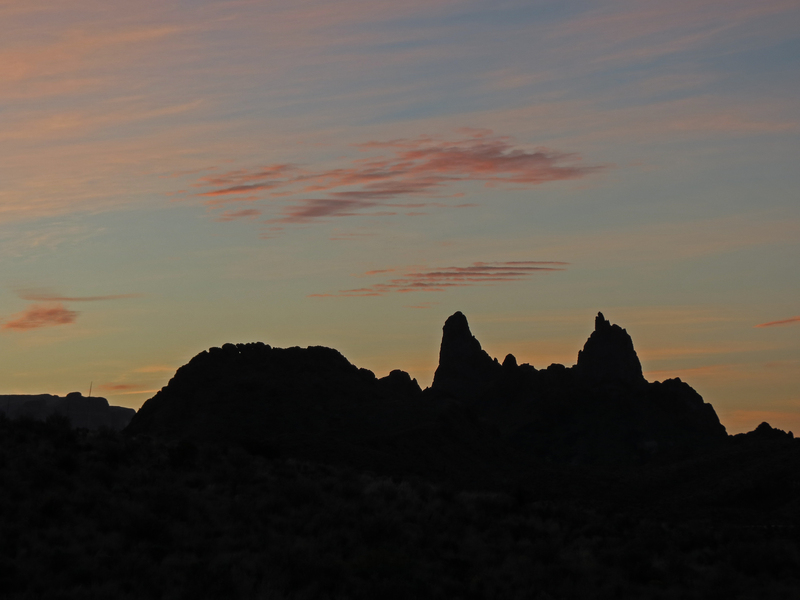 The Mule Ears rock formation materialized in time to stop for the sun’s arrival. Finally having light to see our environs, we took in the bluebonnets blooming on the roadside – uniquely tall and stringy, compared to their short, dense Hill Country cousins. 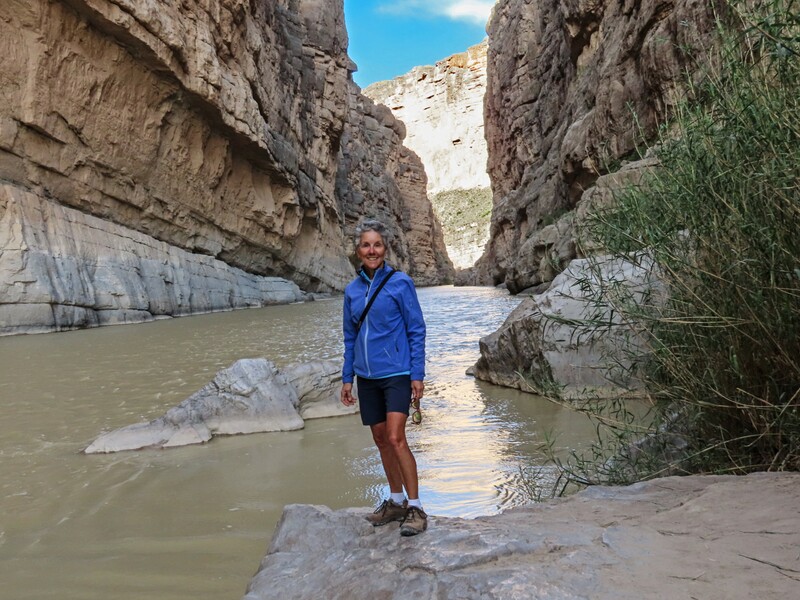 Our destination was Santa Elena Canyon. 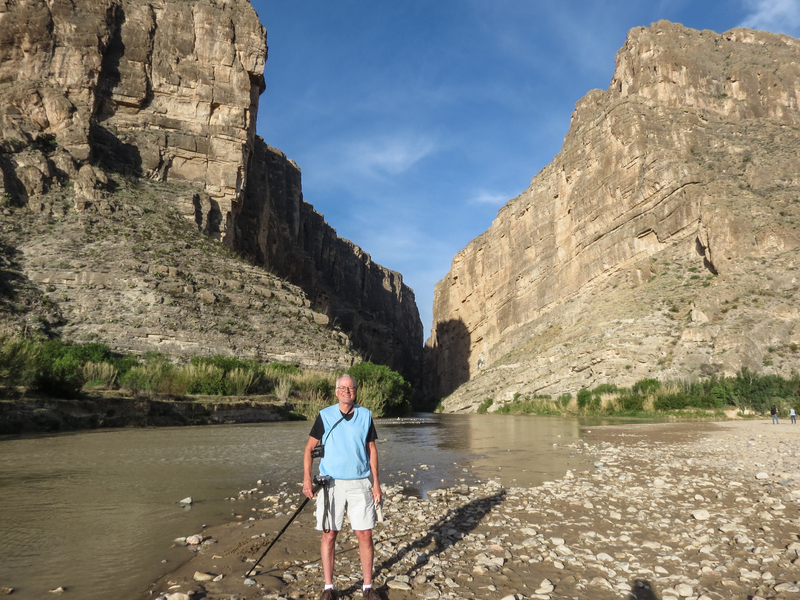 A short walk took us to the Rio Grande and a view of the entrance to the canyon. But the best part was the hike into the canyon. 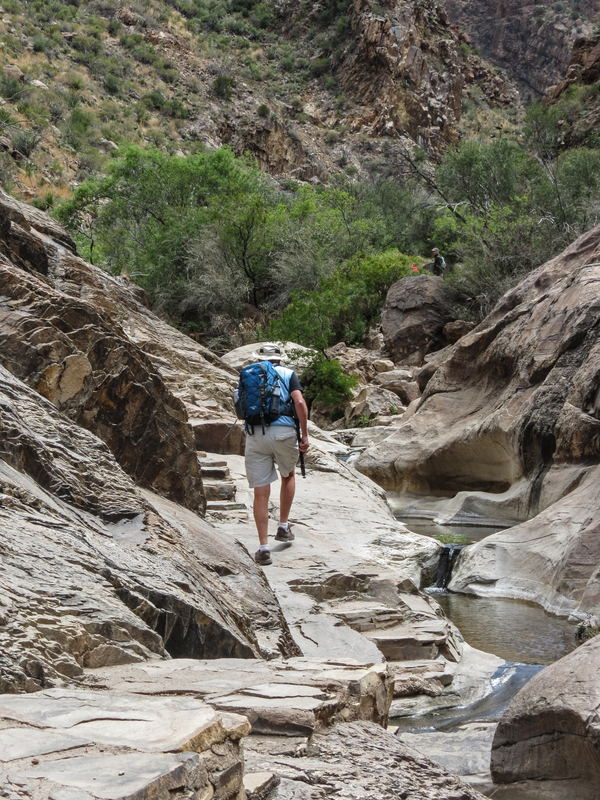 Crossing a narrow flow of water from a side stream, we followed a well-worn path with switchbacks up the edge of the canyon wall. 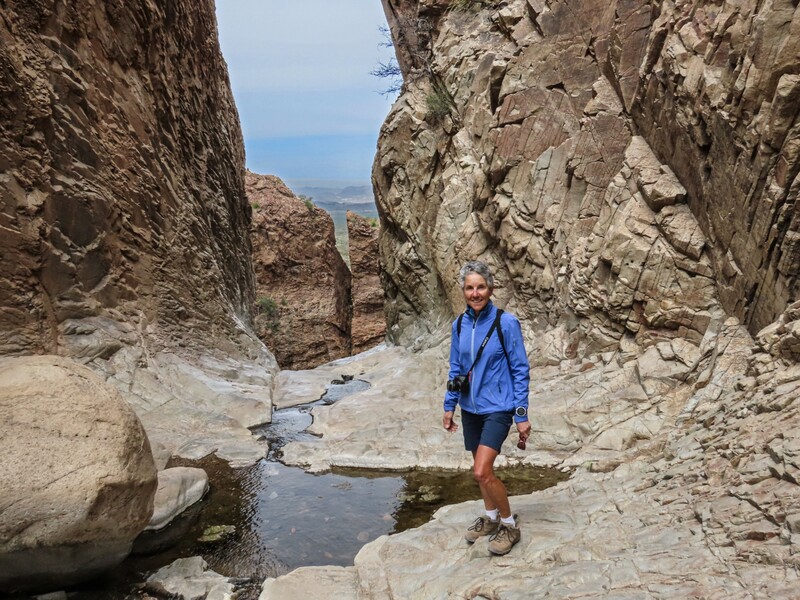 The trail stretched back into the narrow canyon where we could appreciate the river’s handiwork in carving this deep crevice. Nearing the end of the trail, faint musical notes floated through the air. The pipe flute blended naturally with the environment, lending a mystical air to the experience. 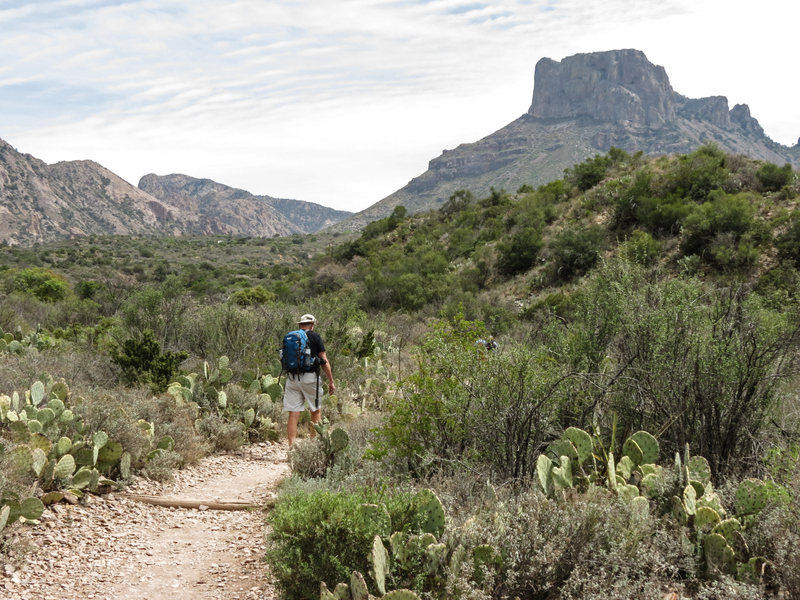 Our second hike of the day was in the Chisos Mountain area in the center of the park. A three-mile walk through scrubby desert environs took us gradually down into the valley. We were at the beginning of the desert bloom, with plentiful wildflowers of all colors and cactus flowers just popping out. The easy path ended with clambering over boulders and hopping across slightly flowing mountain streams. But the end view was worth it – The Window provided an opening with a straight drop below and a narrow crevice beyond. A fierce wind whipped through that window, and I kept well away from the opening. We experienced the extremes of the desert climate when the next day dawned cloudy, super windy and 46 degrees. 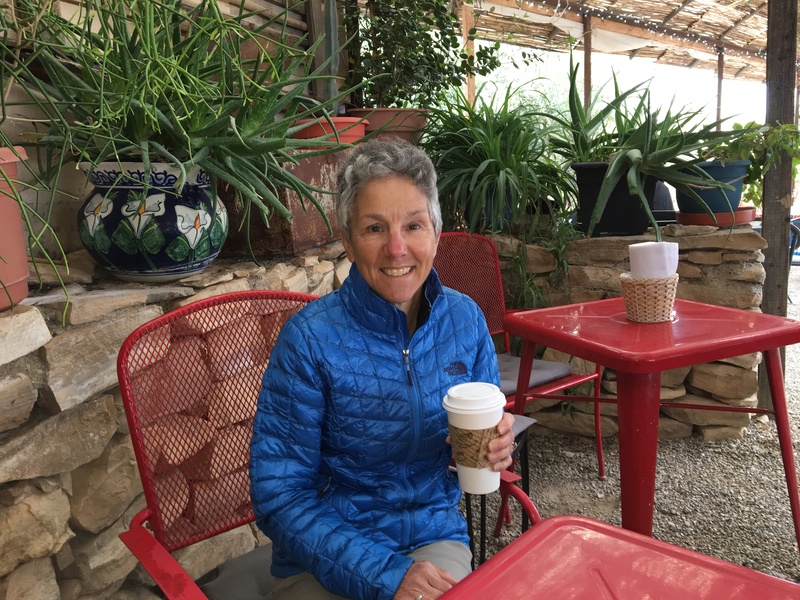 In no hurry to rush out into the chill we headed back into Terlingua to Espresso Y Poco Mas. Geared for the desert heat, the eclectic café offered only outdoor seating. Settling ourselves at a well sheltered table, we were surprisingly comfortable and delighted with the breakfast tortillas. But we were thankful for our Minnesota clothes stashed in the car! With low expectations we returned to the park under the cold cloud cover. But on our first hike, while scouring the environs for elusive birds (Rich) and wildflowers (Molly) the sun emerged. As the sky cleared, the temperature zoomed to a comfortable warmth. Driving to Rio Grande Village at the far end of the park provided a constant panorama of its nature. We were surrounded by rolling desert land covered in bushy vegetation, surrounded by soaring rocky peaks and mesas. It was majestic in its own way, in sharp contrast to the dense forest and white capped mountains that define National Park in my northern mind. The wilderness experience is all relative. By the time we arrived, I regretted forgetting my swim suit to soak in the hot springs. It just didn’t enter my mind that morning. 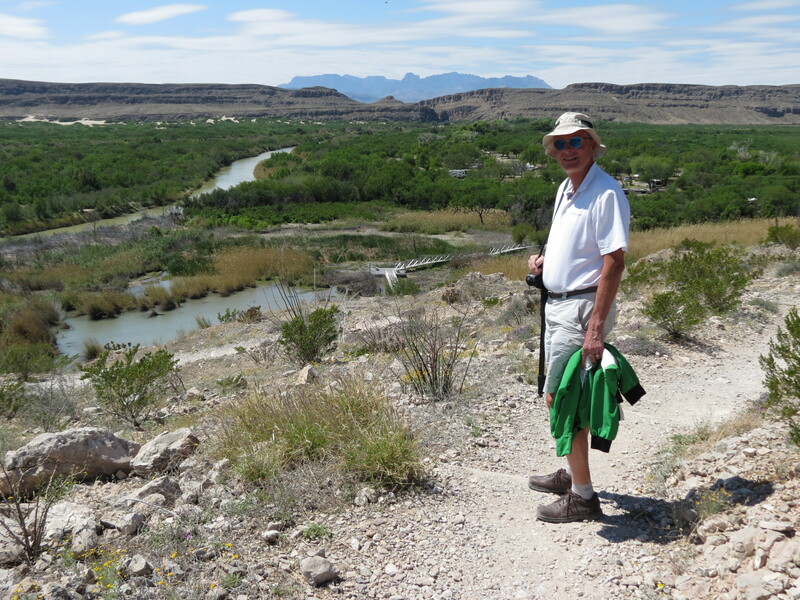 Instead, we walked the local nature trail where we watched nutria at play in the pond, and climbed to a view of the Rio Grande. We capped our visit with dinner at the popular Starlight Theater restaurant. We lucked out that night, getting in without the normal 1.5 hour wait to take in the western décor among patrons clad in cowboy hats and listen to the local guitar playing singer. I’ve decided on one word to describe the overall experience – Quirky. How often do you frequent a former ghost town? Consider a tiny sleeping cabin to be among the best of the lodgings? Hike in winter jacket, mittens and hat, and remove them all within an hour? Explore a narrow canyon and wide-open desert land? 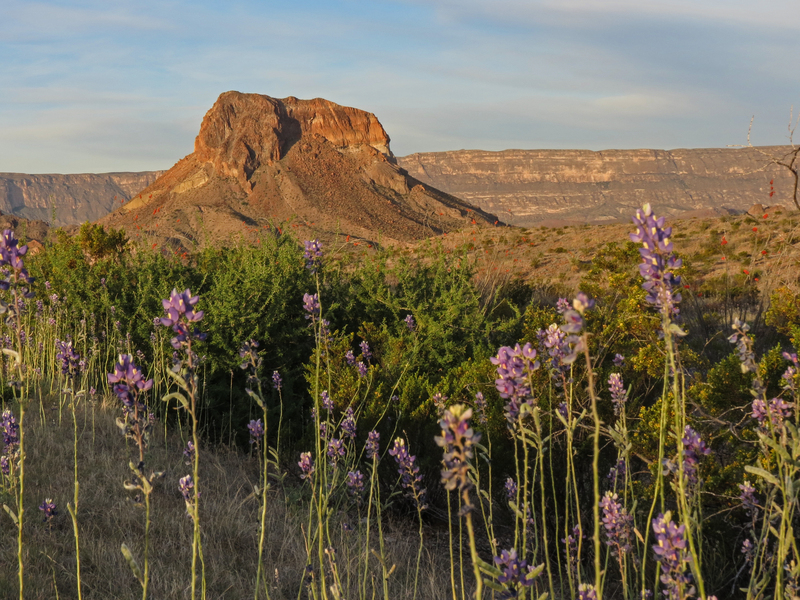 Big Bend with its Terlingua neighbor was all that and more.